Thanks to everyone who has taken a moment or two to read any of my posts. I have enjoyed sharing my thoughts and concepts on Strategy & Operational Performance Management (and a few other topics thrown in for good measure) with you. Have a great Holiday Season and enjoy the rest of the year. May 2010 be one of your better years!! The employment situation continues to demonstrate the frailty of the current economic climate. In Sept the unemployment rate was 9.8%, Friday it was announced that Oct witnessed this number increase to 10.2%. “This is the highest rate since April 1983.” We are also at the second highest point (and growing) in the history of tracking the data – 1948. 1. The Good, it looks like (at least to me) the higher the number, or the swifter the increase, the quicker the the unemployment rate drops. There appears to be a natural slope (green line – A) to the decline in the the unemployment rate after a spike, which then is followed by a less gradual slope that marks a return to a healthy market (red line – B). In roughly 1975 and again in 1983 we saw two spikes which then followed the green line’s slope – except in the case of 1983, we actually saw that trend bear out over the longer term, yet moved faster during the initial recovery period (reb box). 2. 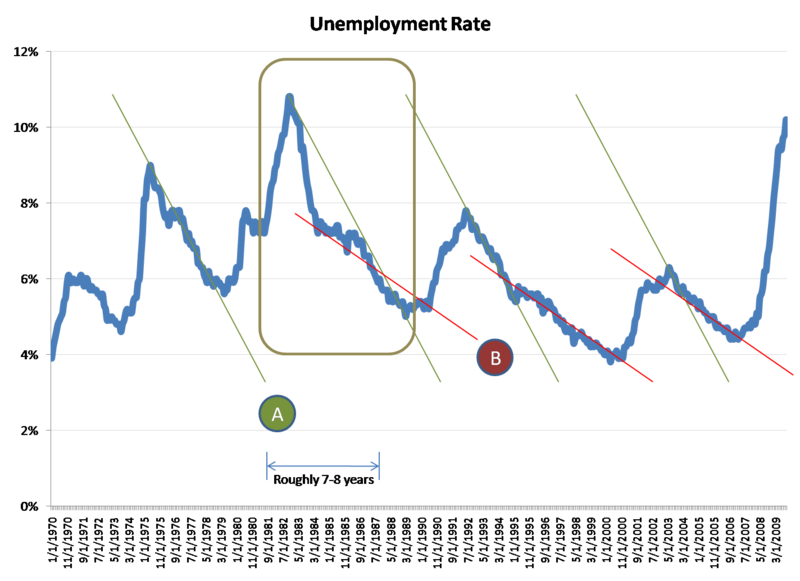 The Bad – if this follows the trend pattern of 1983 we may be looking at another 7-8 year recovery process to return the unemployment rate to around 6% which roughly appears to be natural healthy level. 3. The Ugly – We have yet to see the peak of this trend. And even if this does turn around in the next month or two, we are so bad a shape across so many other sectors it may take far longer for us to return to a 6% unemployment rate. If we continue to see credit tighten up at the rate it is going, we will see continued pressure on unemployment.